Funafuti is an atoll that forms the capital of the island nation of Tuvalu.It is a narrow sweep of land between 20 and 400 meters wide, encircling a large lagoon 18km long and 14km wide, with a surface of 275square kilometers, by far the largest lagoon in Tuvalu. The land area of the 33 islets aggregates to 2.4square kilometers, less than one percent of the total area of the atoll. There is an airstrip, hotel (Vaiaku Langi Hotel), and administrative buildings, as well as homes, constructed both in the traditional manner, out of palm fronds, and more recently out of cement blocks. 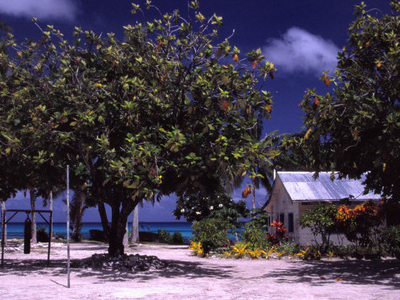 The most prominent building on Funafuti atoll is the Fetu Ao Lima Church of Tuvalu. Here's the our members favorite photos of "Cities in Tuvalu". Upload your photo of Funafuti!